Number 1 in Local History ! The above photographs were taken at Marley Hill School in 1995 whilst celebrating the schools 100th birthday. 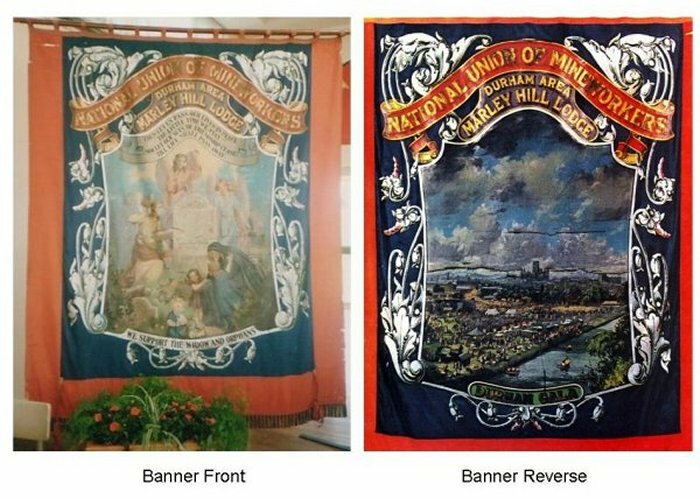 Sadly the banner has vanished while in the custody of the NUM Headquarters Redhills. Despite a publicity campaign and a Police investigation, the banner remains lost. We are contemplating applying for funding to have a replacement banner constructed. We usually meet on the first Tuesday of each month at 7.30pm in the luxurious concert room of Sunniside Social Club complete with bar facilities. The annual programme includes a wide range of subjects delivered by guest speakers and in house presentations compiled using the latest in computerised and digital equipment. We also enjoy outings to sites of historical interest, as well as catered social events. Visitors and new members are always most welcome. Life membership fee is just £1 with a cover charge of £1 per meeting thereafter subject to attendance. 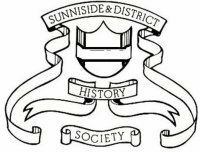 WE HAVE TAKEN THE DECISION TO INSIST THAT NEW SOCIETY MEMBERS SHOULD ALSO BECOME MEMBERS OF SUNNISIDE SOCIAL CLUB. WE THINK IT ONLY FAIR WHEN WE ARE AFFORDED THE EXCELLENT FACILITIES AT NO COST WHAT SO EVER. AS OF 2013 FULL MEMBERSHIP COSTS £10.00 THERE AFTER JUST £1.00 PER ANNUM. Unfortunately there is a limit (in keeping with all websites) to what we can display on the site. To add new information we need to remove an existing item. It is a difficult decision, but we have a record of the number of hits on each item. The one receiving the least hits is the one we must delete. Please do not think that we like doing this and apologies to anyone who has contributed to the site and realised that their work is deleted.